A watercolour in the Wellcome Library (left) shows an interior with three figures. In the centre a plump, self-satisfied looking man looks down with approval at the work of the second figure, on the right, who is Death himself. Death is a tall and physically active skeleton wearing a tie-wig: he vigorously stirs a pestle in a mortar to grind up ingredients for medicines. Some pharmaceutical vessels are shown on the floor around them, and the shelves in the background are full of apothecary’s glassware. The third figure is a woman patient who sits in front of the fireplace on the left, gripped by illness. The obvious interpretation is that the man is an apothecary (pharmacist), hence the glassware on the shelves of his house. Death is the apothecary’s business partner, making up medicines with lethal side-effects: clearly the woman is going to die as a result of taking the harmful medicine. Right? No, not exactly. If the setting is an apothecary’s shop, the sick woman wearing night-clothes would be sitting in front of the fire in the pharmacist’s establishment, not in her own home. To explain that improbability, one would have to assume that she is meant to be a member of his household — which would rather reduce the applicability of the joke and take the edge off the humour. As the watercolour is attributed to the ever-humorous Thomas Rowlandson (1756-1827), that would be a problem. 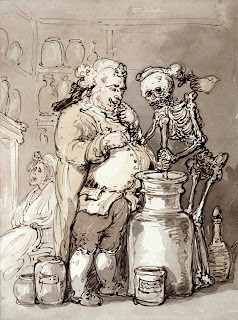 A possible clue to the subject came to light in January 2012 when Christie’s in New York offered at auction another watercolour version of the same composition, inscribed in what looks like Rowlandson’s hand “Dr Brodum and his assistant at work pro publico bono“. So who was Dr Brodum? William Brodum (right) was one of several members of the Georgian medical fringe who were portrayed by caricaturists. 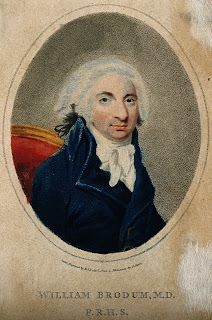 Samuel Phillips Eady, also portrayed by Rowlandson and discussed in this blog-post, was another who could be so described. Unlike Eady, Brodum is dignified by an entry in the Oxford Dictionary of National Biography (ODNB), where evidence is cited that he was a Danish Jew, born Issachar Cohen in Copenhagen around 1767. He came to England around 1787 to work for another medicine vendor (Dr Bossy), using the name William Brodum. He obtained an Aberdeen M.D. degree in 1791, and from his house at 9 Albion Street, Blackfriars Road, London, launched his own career as a medicine vendor, specializing in two product lines: “Doctor Brodum’s Botanical Syrup for the cure of scorbutic, leprous and scrofulous complaints” and “Doctor Brodum’s Nervous Cordial for the cure of consumptive, nervous and debilitated constitutions, and people who have been in hot countries”. His advertising for these products included a lot of code words that were euphemisms for syphilis (debility, leprosy, nervous weakness etc. 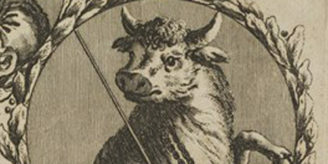 ), and the same insinuation was gracefully made in the title and body of a two-volume publication, Guide to old age, or, A cure for the indiscretions of youth (1795), dedicated to King George III, whose favour he received. 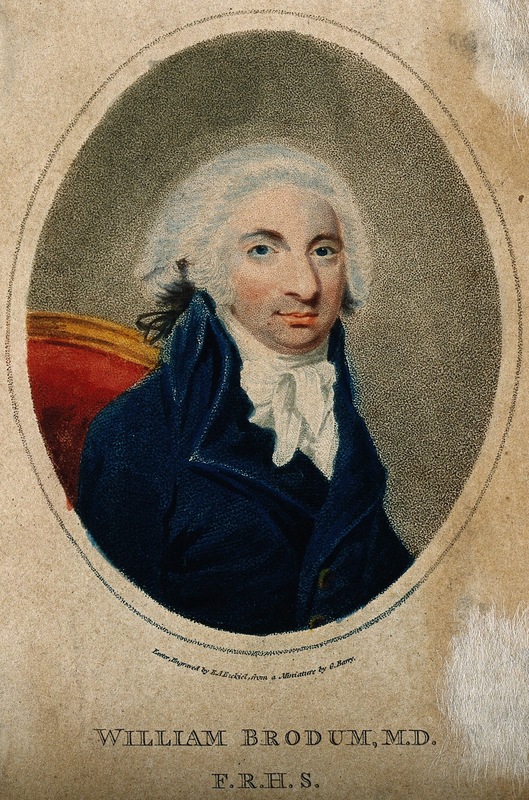 A miniature portrait of him around this time was published in an engraving by Ezekiel Abraham Ezekiel (1757–1806), a member of the Jewish community in Exeter (above). Whether by accident or design,the goings-on in Rowlandson’s watercolour fit this situation perfectly. If the man is meant to be identified with Brodum — he died in 1824 and Rowlandson in 1827 — we need not ask whether it shows a medicine vendor or a physician. Brodum and Death together make up the medicines at Brodum’s pharmaceutical laboratory in Southwark, while the patient in the background, huddled in front of her own fireplace, represents the use to which the medicine will be put in Brodum’s medical practice.